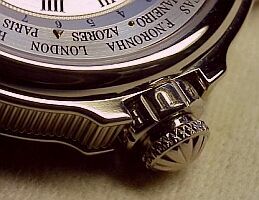 development of smaller and thinner watches in order to produce ever larger and more easily noticed medallion-like ornaments. There is a certain stigma attached to jewelry and decoration — such things express an exuberant joie de vivre that we find or at least condemn as distasteful. There are a few with either the daring or the “bad taste” to defy the gods of Modesty and indulge in ostentation, but the rest of us only tremblingly taste of this forbidden fruit in diluted form — with a few elements of the Baroque hidden within the designs of the modern Swiss watch. More than any other time, the Baroque Age saw the machine as novelty, art, jewel, adornment, and affectation, and indeed celebrated this unreservedly. At the start of that period in the 16th century, pendants were the most important and elaborate form of jewelry — having the most money and effort placed into their construction. It was this world which the watch entered, becoming the most exclusive form of pendant adopted by royalty, aristocrats, and merchant princes. In some ways, this is what the mechanical watch has become again in the modern revival — an exclusive pendant for the wrist. The ornamental and decorative styles which we encompass under the “Baroque” label have their roots in Italy with the grand and palatial reformation of the Vatican. Just as the Renaissance had brought Classical forms once more to light, so did the Baroque with the Byzantine, and like Byzantine art the arts of the Italian Baroque focused primarily on religious images and themes. The Roman church had long eschewed the openly Oriental opulence of its rival the Eastern church, until the final destruction of Byzantium by the Ottoman Turks in 1453. The rebuilt St. Peter’s Basilica for example, though begun in the Renaissance was eventually finished with the intent of surpassing the Basilica of Constantine – making it the crown jewel of Baroque Italy. From there, the highly ornamental style swept through Rome and throughout Italy, and followed the Sun west to France. 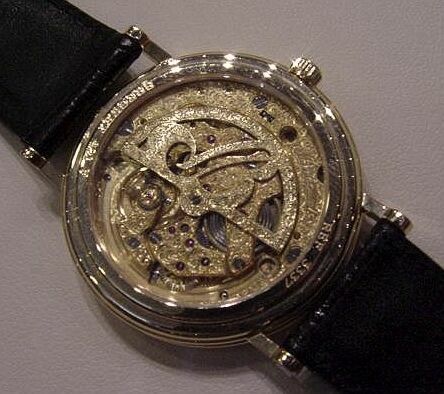 watch making guild by 1544, surpassed that of England and Germany. watch making craft. But even in losing technical superiority, France continued to have great aesthetic influence upon its neighbors as it became the center of manufacture for the “baroque” artifacts which it exported throughout Europe. The watch dials of the Baroque period were most often made of silver, gold, or gilt brass, and engraved with heavy roman numerals. More elaborate, decorative engraving became more common around 1650 as the “rose engine” lathe came into greater use, making it easier to engrave elaborate scenes and figures. The rose engine remains a common decorative tool in France for fine woodwork, and has long been used for the characteristic decoration of the traditional knives made in the village of Laguiole. IWC’s Da Vinci “Four Seasons” Tourbillon shown above typifies the emphasis on mythic and allegorical themes (rather than religious themes) of the French Baroque. 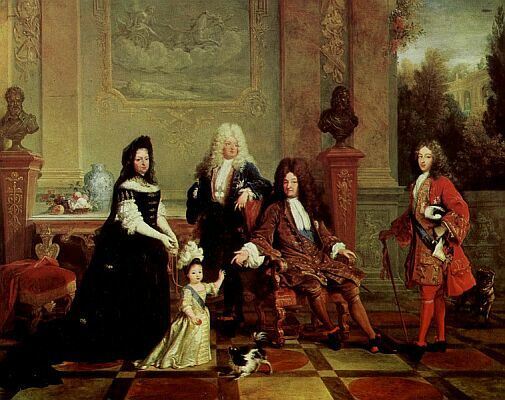 It was a particular pleasure of Louis XIV to have himself and his contemporaries depicted as characters in such settings. Whether engraved freehand or with the aid of a rose engine, the engraved precious metal dial remains very scarce, produced only by of a few master watchmakers, or as limited edition production pieces. to watch dials, depicting similar mythological and allegorical themes, as well as battle and pastoral scenes, portraits, and exotica like the fauna of India and Africa. Colour was an essential part of the Baroque embellishment of Classical forms. 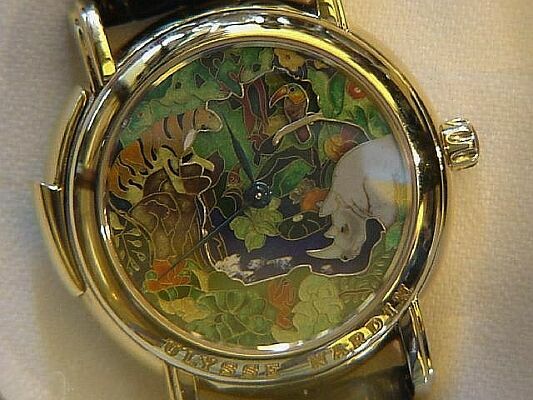 cloisonné remain rare today, practiced by a few Swiss watch making houses like Ulysse Nardin, Bovet, and Vacheron Constantin — as with the Les Complications “Le Geai a Longue Queue” shown above. Case designs of the period were no less ornate than the dial-work. The large and thick cases were often made of gilt silver or brass, sometimes gold, and often in elaborate shapes that made the case a work of sculpture in itself. 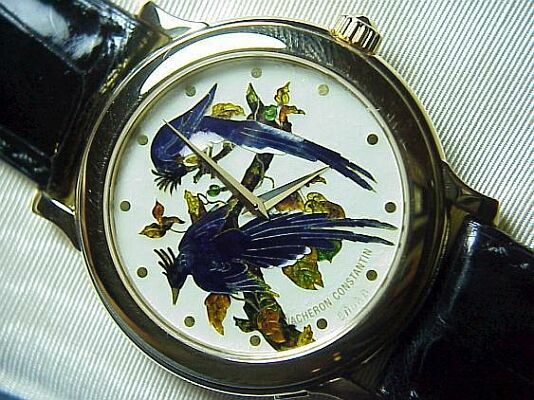 Further elaboration of cases with extensive engraving, and/or enamel-work was de rigueur. The final touch was the heavy gold chain by which most watches were hung from the belt or neck. Reflections of these times can be found in in many places, some more or less obvious. Oval cases like Audemars Piguet’s present-day Millenary collection enjoyed a long period of popularity in the early Baroque (about 1570 to 1630). The heavily elaborate case work of Parmigniani Fleurier is greatly evocative of the Baroque sensibility with its extensive use of Greco-Roman elements in an enriched form. Finally, the gold chain finds its modern form in the gold bracelet, which appears to be growing in popularity once more. A lesser known element of the period is the use of automata — particularly when integrated into horological devices. While jaquemarts have their origin in the Renaissance, the early Baroque period saw their refinement and elaboration, resulting in the integration of clockwork and automata on a much smaller scale. Instead of existing exclusively in tower clocks, they became an element of interior decor with table clocks — often used as centerpieces. Final integration into the pendant watch however, did not occur until late in the Rococo period. 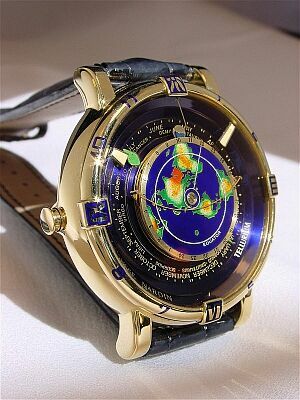 In a non-mechanical world the machine was nearly magical, and even in our technologically advanced age many endow the mechanical movement with a “soul.” The elaborately pierced and chased movements that hark from this time attempt to conceal the coldness of the machine under a gilded warmth. Visually, the ornate and complex web of mechanics becomes an allegory for something heavenly or diabolical. descended from those times — though it should be noted that the French never embellished movements to the degree common to English watches of the period. I have heard few voices raised against this form of movement decoration, and it is usually applauded whenever and wherever it is found. 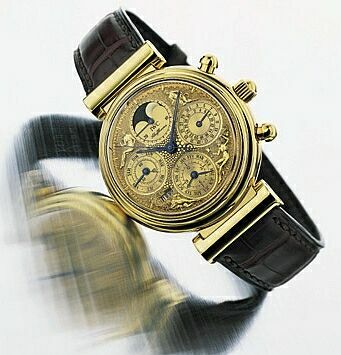 Brands like Breguet (shown), Franck Muller, and Dubey Schaldenbrand are best known for this practice. As long as he lived, the influence of the Sun King shone radiantly upon French aesthetic sensibility. 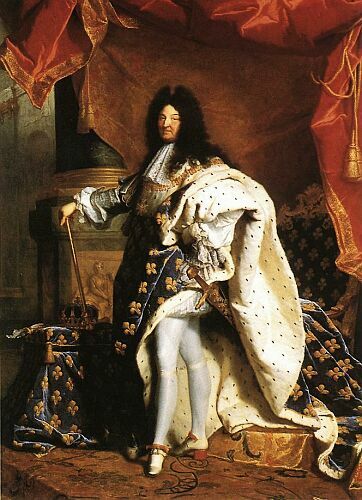 With his heirs, the influence of the rulers of France would slowly dwindle until they finally ceased to be. His secularization of the Baroque style has left a lasting impression upon us, and as we have seen, elements of this vision linger yet in a few of the horological crafts of Switzerland — even if the source is no longer remembered. In part two we will trace the heritage of the classical wristwatch which follows hard upon the close of the Baroque Age. 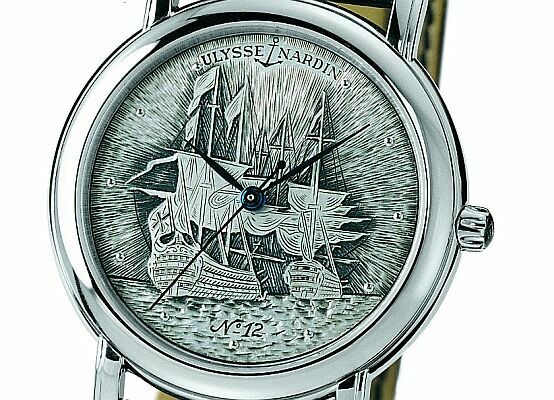 Portobello by Ulysse Nardin, Inc.